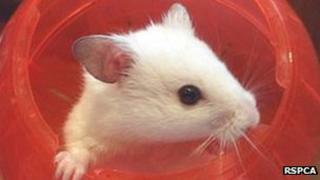 A hamster has been rescued after it was seen running down a road in a plastic ball in Worcestershire. A Kidderminster resident "thought he was dreaming" when he saw the red hamster ball roll past at 00:30 BST on Tuesday, the RSPCA said. "It is exceptionally lucky it was found safe and well and wasn't hit by a car," a spokesperson said. The RSPCA said it had put up a poster to try to find the hamster's owners after it was found on Salisbury Drive.